Every IT admin has to constantly stay on top of their network’s performance because it is one of the most critical resources for the organization. They can’t allow the network to go down even for a few minutes, as this could translate to a big loss for the company. At the same time, managing a network of any size is not easy. This is why tools like packet sniffers come in handy to identify problems and to troubleshoot them quickly. The main task of packet sniffers is to check if data packets are being sent, received and transmitted correctly within the network. In the process, it can also diagnose different network-related problems. All packet sniffer tools and software analyze the header and payload of every packet that passes through it. Accordingly, the packets are classified and analyzed. Due to the widespread use of packet sniffing as an efficient form of network troubleshooting, there are many choices available for you today. 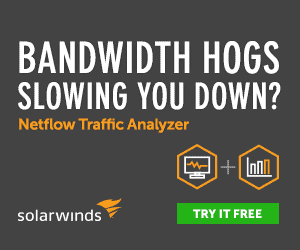 SolarWinds Packet Analysis Bundle analyzes the network to identify problems quickly. 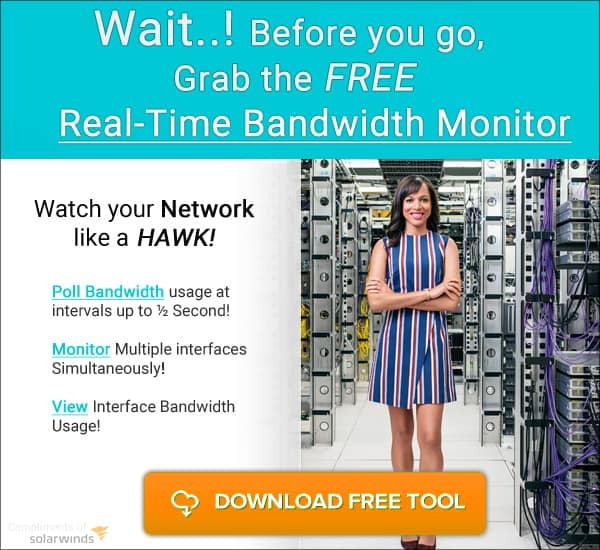 Its an extremely well-rounded tool that delivers a ton of data on your network connections and can assist you in pin-pointing issues quickly and efficiently. Below are some things it can do for your business. Determines whether the problem is with the network or application, so you can work on the respective fix. Identifies spikes in traffic and data volume, as this could be due to a potential security breach. Continuously scans more than 1,200 applications on your network, so you can get a better idea of your network’s traffic. 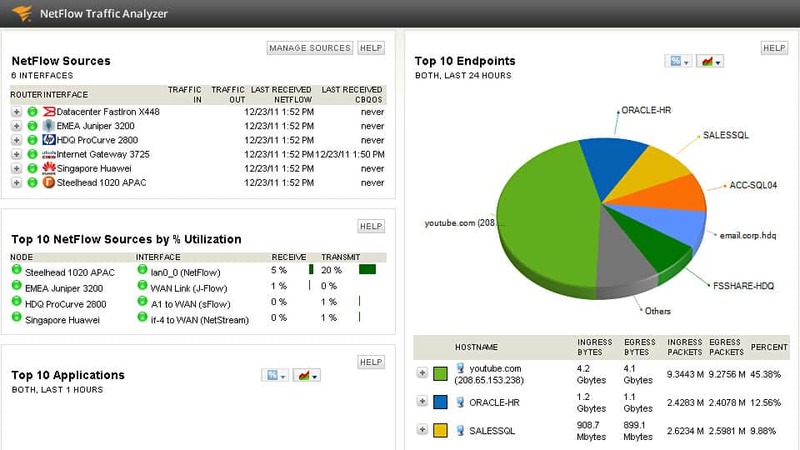 Provides a snapshot of your network’s traffic at any time. Comes with advanced reporting tools to help you understand your traffic. Offers deep insights into the traffic patterns. Monitors many different metrics such as response time, data volume, transactions and more. Classifies traffic into different categories based on the type of traffic, volume and risk levels. Such classifications make analysis a breeze. 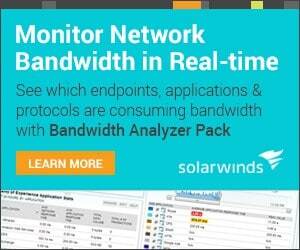 SolarWinds Packet Analysis Bundle comes as a part of the comprehensive Network performance Monitor. Download and Run for FREE for 30 Days! 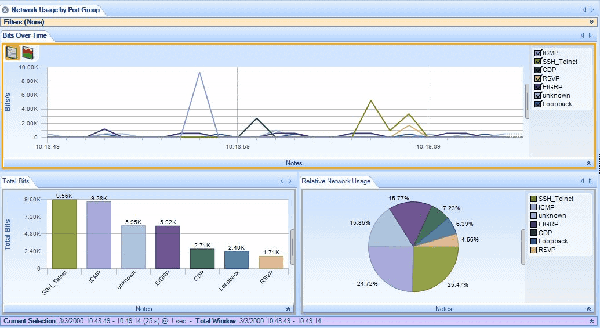 SteelCentral Packet Analyzer is a network packet sniffer from a company called Riverbed. This tool comes with a host of features that is sure to take some pressure off every IT admin. You can easily isolate traffic using drag and drop and multi-level drill down interface elements. Comes with an extensive collection of analysis views. You can configure triggers and alarms to catch unusual behavior. Scans through millions of packets for transaction prediction and analysis. Lets you merge and analyze multiple trace files at once, to get a better idea of the network behavior. Pinpoints the exact problems on your network, in many cases. Supports hundreds of views and charts for analyzing network traffic. Charts can be customized or imported/exported in many formats. Customized reports include conversations at all layers, IP fragmentation analysis, DHCP address assignments, TCP top talkers and unicast, multicast and broadcast traffic details. Has an intuitive graphical user interface. Kismet is a wireless network detector, sniffer and intrusion detection system that works primarily on Wi-Fi, though it can be expanded to other types of networks too through a plug-in. Offers PCAP logging that’s compatible with other packet sniffing tools such as Wireshark and TCPDump. Follows a client/server architecture model. Has a plug-in architecture, so you can expand the functionality of core features. Gives the option to exports packets to other tools through a visual interface. This export can be done in real time too. Provides support for other networking protocols such as 802.11a, 802.11b, 802.11g and 802.11n. Wireshark is one of the most popular packet sniffer tools available today, and much of this popularity is because it allows you to monitor your network at the microscopic level. In fact, it is the de-facto standard across many commercial, non-commercial, educational and government organizations. Here’s a look into some of its features. Information obtained through Wireshark can be easily imported to other formats such as CSV, XML, PostScript or plain text for easy readability. Provides intuitive analysis with color coding. Has one of the most powerful display filters in the industry today, so you can customize the output to know just what you want. Captures data in real-time and allows the same to be analyzed offline. Works with hundreds of protocols, with more being added every day. Comes with a standard three-pane packet browser. Runs on Windows, Linux, OS X, Solaris, FreeBSD, NetBSD and more. You can browse the collected data through a browser-based GUI or a TTY-based TShark tool. Reads and writes many types of file formats such as Pcap NG, TCPDump, Microsoft network monitor and more. Any file compressed with gzip can be decompressed quickly. Supports many decryption protocols such as IPSec, SSL/TLS, WEP, WPA/WPA2 and more. Wireshark is free to use. TCPDump is a common packet sniffer that runs in the command line. This tool displays the TCP/IP packets that are transmitted over the Internet, so you’ll know how many packets were transmitted and received, and based on this, you’ll be able to identify any problems in the network. Prints out the description of packets on a network interface using a boolean expression, so it is quick to read and understand. Gives the option to write a packet to a file for later analysis or to read from a saved file. 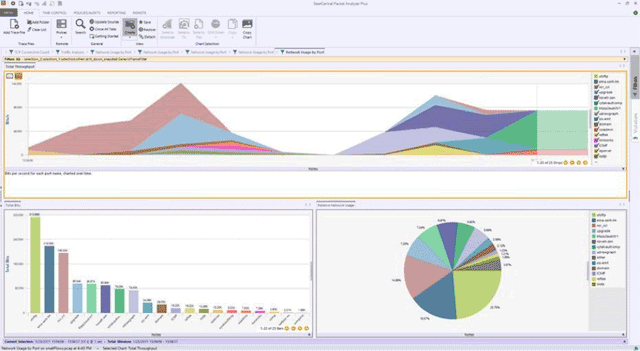 Creates a comprehensive report after capturing the packets. This reports contains information such as the number of packets received and processed, packets received by the filter, packets dropped by the kernel, description and timestamp. Provides the option to flush the packet buffer into an output file. Its different options allow you to customize the output based on your requirements. Works well on most Unix-like operating systems such as Linux, Solaris, BSD, Android and AIX. TCPdump can be used specifically for intercepting and displaying the communications of a particular user or computer. In networks with high volume of traffic, users have the option to set an upper limit on the number of packets captured by the tool. This makes the output more readable. TCPDump is an open-source tool that’s free to use. In short, packet sniffers are essential to understand the communications passing through your network, so you can identify and fix issues before they grow into huge problems. We suggest downloading one or All of the tools above and testing out to see which one works the best in your environment – as they all have their Strengths and weaknesses.